In general there has been no attempt at uniformity of practice in the delineation on maps of underground water features or of wells or springs… …it now appears desirable that a concerted movement be made to develop a uniform system of symbols for use on maps. The number of symbols devised should be sufficient for the representation of all features which it is desirable to show. If wholly arbitrary devices are used, confusion will result whenever a considerable number are used simultaneously, but this difficulty will be largely avoided if the system adopted is based on a few suggestive forms grouped according to easily remembered principles. It is believed that a system of symbols can be most logically developed if a single arbitrary device is taken as a base. In common practice a circle is most often used for a well, while more or less closely allied devices are used for springs. Inasmuch as both wells and springs are ordinarily approximately circular, this device, which seems to have both the required simplicity and suggestiveness, is proposed. 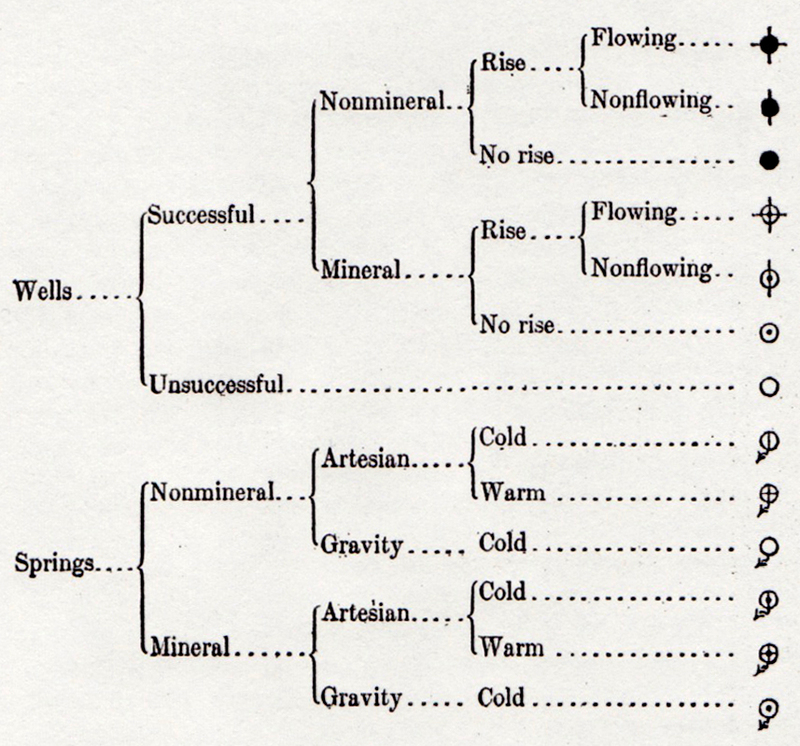 Words of map symbolization wisdom from “Representation of Wells and Springs on Maps” by Myron Fuller in Water-Supply and Irrigation Paper No. 160, U.S. Geological Survey (1906).